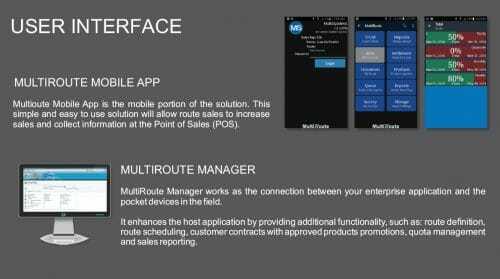 MultiRoute provides full mobile inventory control, route itineraries, customer profiling, route quotas, suggested orders, cash control, pricing, promotions, signature capture and printing capabilities. MultRoute helps to eliminate the data entry process from the field sales loop, shortening the time to deliver products to the customer. It generates sales orders automatically based on the inventory levels and buying habits shortening your sales process, while increasing available time to visit more accounts in the same span of time. This cloud-based solution enables businesses to obtain immediate return of investment with a low monthly fee and no servers to manage. It supports integration to multiple ERPs including Microsoft Dynamics GP and AX, SAP Business One, all Sage platforms, among others. Customers can even develop their own connectors with our API SDK toolkit. Multioute Mobile App is the mobile portion of the solution. This simple and easy to use solution will allow route sales to increase sales and collect information at the Point of Sales (POS). Reduce order processing time by eliminating manual entries, allowing to spend more time with customers. Keep your sales reps updated with the latest product information at the POS. Engage customers using sales history and latest information. Company profile and products presentation at the point of sale. Minimize your order delivery process time, allowing to spend more time with other. Real time warehouse inventory stock quantities. View sales information right on the mobile device and collect electronic signatures. Send invoices & receipts via e-mail. Know where your transactions are being made. Allows to send encrypted transactions to the back office and receives any updated information through Web Services.